You got a good deal. It's adorable. Looks like fun & a great deal! Some reason my son calls him Dark Mater. Makes me giggle every time I think about it! 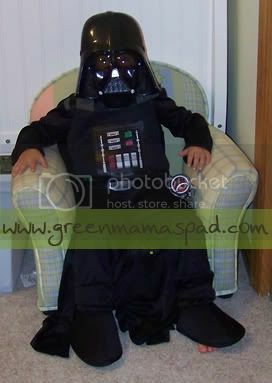 I can only imagine when my little guy is into Star Wars! Looks like that $5 was well spent. How fun! My nephew would love it since he is such a fan. My son Lucian was just a ghost earlier today with a blanket over his head. I love dress up! Happy WW and thanks for stopping by my blog! What a cool costume - and an awesome deal! awesome deal and very cool costume! My nephew used to tell people he was going to be a Jedi when he grew up. Seriously. That is too funny. Cute. What a great find!! Dress up is always fun! How funny! My boys love to dress up in their old Halloween costumes. We used to pull out all the old Halloween costumes starting Oct 1st and then we'd play dress up with them all that month. 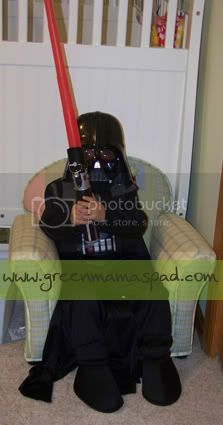 I have an unhealthy fear of Darth Vadar... but it could be remedied with someone as cute as that one! Darth Vador is scary and intimidating. Cool costume and even cooler price! LOL, that totally caught me off guard. I jumped! In my house, dress up is any Disney Princess Dress. This looks like so much fun! You are too smart, I can never plan that far ahead. Cute! My little nephew loves Star Wars and was DV last year!! !